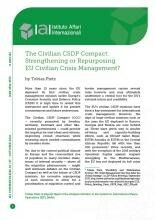 More than 15 years since the EU deployed its first civilian crisis management mission under Europe’s Common Security and Defence Policy (CSDP) it is high time to revisit this instrument and update it for present circumstances and future endeavours. The Civilian CSDP Compact (CCC) – recently promoted by Sweden, Germany, Denmark and other like-minded governments – could provide the impetus for new ideas and reforms, improving overall structures while renewing much needed commitments by member states. Check the full paper here.